Optimus brings you the finest in fans and heaters. 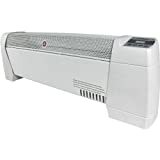 The H-3603 is a baseboard convection heater. Features include two heat settings of 750 and 1500 -Watt, automatic thermostat control, three position function switch with off, low and hi settings, internal heat limiting thermostat, and power indicator light.